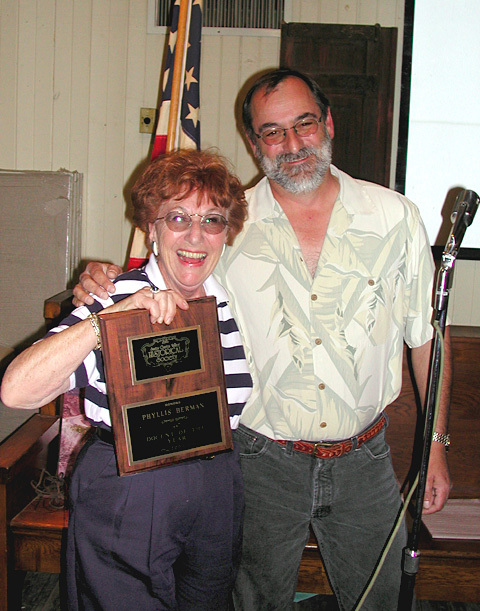 April 9, 2003: Phyllis Berman is named the Santa Clarita Valley Historical Society's Docent of the Year for 2002 (seen here with Docent Coordinator Alan Bofenkamp). A resident of the Friendly Valley section of Newhall, Phyllis is employed locally with the Los Angeles County Sheriff's Department. She went through the SCVHS docent training program in 2000 and has been a consistent volunteer  not only at Heritage Junction Historic Park, but she also lends a hand with Society fund-raisers and functions. In December 2002 Phyllis wore period dress as she assisted with the Society's Holiday Open House.